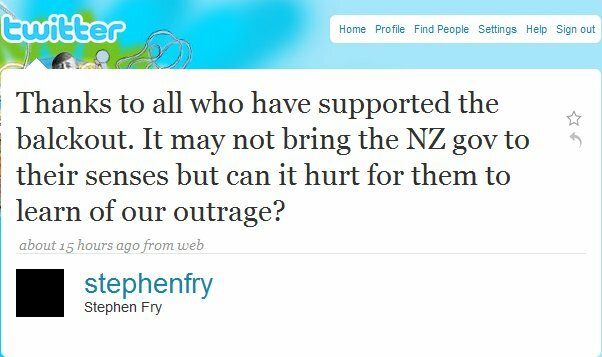 You may have noticed a number of avatars turning black since the start of this week, this blackout is only a part of the actions planned during the recent FooCamp to draw attention to New Zealands impending copyright law changes. 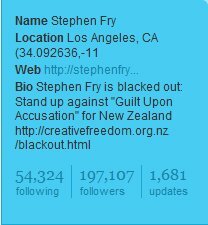 Stephen Fry even joined the fray blacking out his avatar, changing his bio and posting updates such as this one [image] – once he joined in and linked to a story covering the blackout, that was it for the hosting site… for a few minutes at least, he did apologise… and got some coverage from the NZ media about it (and on Stuff). Just to be clear, I am not advocating stealing copyrighted works, the reason I created this post is that I (personally) believe that S92 has a number of fundamental flaws which require attention now, rather than a retrospective patch up job. Also, an interesting result from some digging around ARPA by Simon Lyall can be found here. Joining the ‘interesting’ articles, is this one which outlines Clare Currans view on S92 even down to the view that “there are significant issues with the controversial Section 92A” and this one from Tony Millett of the LIANZA’s Copyright Taskforce. Juha has also published an interesting article summising the RIANZ responce to the industry TCF here.